Looking for loving, permanent homes for these adorable puppies. 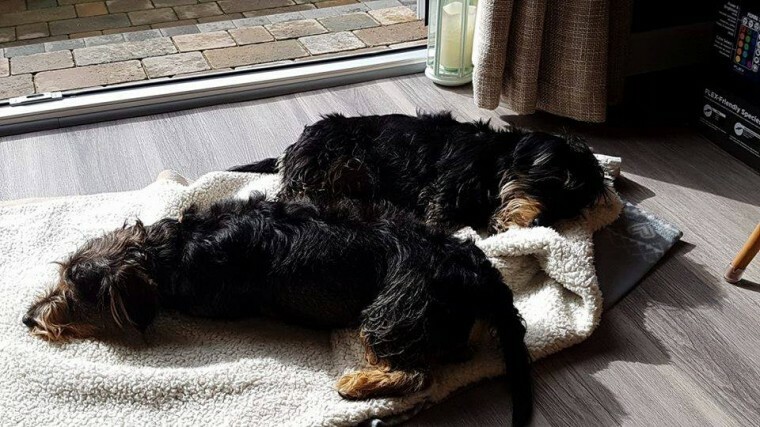 Mum is our much loved KC registered miniature Schnauzer and Dad our wonderful KC registered Miniature dachshund. Both have wonderful temperaments and are good with children and other animals. Both Mum and Dad's paperwork can be viewed. These gorgeous little pups have proven to be excellent family pets, as I have remained in contact with several people who gave good homes to my previous litter, informing me they were loving, loyal little dogs with fantastic temperaments and very clever. Puppies will resemble the Miniature wire haired Dachshund when mature as you can see from the pictures of the previous litter. My puppies shall leave me having being fed a high quality food, wormed every two weeks from birth, frontlined prior to leaving as a precaution, will be fully vet checked, micro chipped and will receive their first full primary vaccination and will have a quality puppy pack to include food and an information sheet on the ongoing care of your puppy, however I am always on hand for future advice if needed. Puppies can be viewed alongside Mum and Dad on or after 25/03/18. If you require any further information or would like to arrange to come and see the puppies please telephone. Withheld numbers will not be answered.